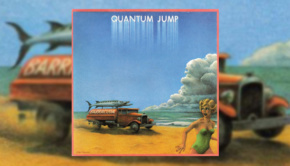 Quantum Jump was Rupert Hine’s mid-70s experiment in song-based fusions of funk, pop and jazz after his solo albums Pick Up a Bone (1971) and Unfinished Picture (1973). The band consisted of virtuoso guitarist Mark Warner, John G Perry (the bassist on Caravan’s seminal 1973 album For Girls Who Grow Plump in the Night), Trevor Morais (drummer of the Peddlers) and of course Rupert Hine himself. Together, these four combined disparate elements to make something that I really don’t think I’d define as prog, but would definitely rate as interesting nonetheless. If I were on ProgArchives, I’d label this as “prog-related” or even “prog-pop” at a push. I’m not saying it’s interesting because of how much I enjoy it by the way; this is more of a fascinated glance at mid-70s attitudes towards what could be achieved in pop music. This sort of thing would surely never chart nowadays. Unexpectedly, but rather satisfyingly, this is an album of two halves; the cheesier pop comes on Side 1 while the more experimental efforts are left for those who are patient on Side 2. This means that the album actually seems to get steadily better as you listen to it, starting with the lamentable aforementioned Captain Boogaloo and culminating with the rather progressive (relatively) four-part suite Something at the Bottom of the Sea. More on that later. When all’s said and done, I actually quite like it. It’s light, fluffy, and has a good rhythm, which steadily increases throughout the piece. Indeed, this rhythm had to be standardised when it was remixed for a disco-oriented audience a few years later. However, the best track on Side 1 is easily the last, the unwieldily titled No American Starship (Looking for the Next World), which is where Quantum Jump really start to show what they’re made of. This is an energetic song with a driving rhythm and a fantastic guitar solo over the powerful outro. Over on Side 2 are tracks that may be of more interest to prog fans. Alta Loma Road has a faux-haunting atmosphere for the most part, but out of nowhere breaks into a full-speed instrumental section that gives the song a surprising character. Cocabana Havana is somewhat similar, starting with a cheesy rhythm and comedy lyrics (“Lickalippin time, she’s like an extra hot potato!”) before dropping into a seriously heavy and fast-paced instrumental. Smokin’! Constant Forest is a pit stop slow instrumental before the album’s showpiece, the highly bizarre, rather progressive, four-part, eight-minute suite Something at the Bottom of the Sea. This track is so out there that the final part doesn’t even have a pronouncable name; on the original LP there is simply a wavering line in its place – the Esoteric reissue unfortunately fails to replicate this. Once again, lots of speedy instrumentals here with a jazz-fusion feel. Most of the first three parts are in 7/8 switching occasionally to 6/8 for the lyrical sections, which should really tickle prog fans. The final three and a half minutes however are very different, a slower but more tense spooky outro with heavy emphasis on the bass. 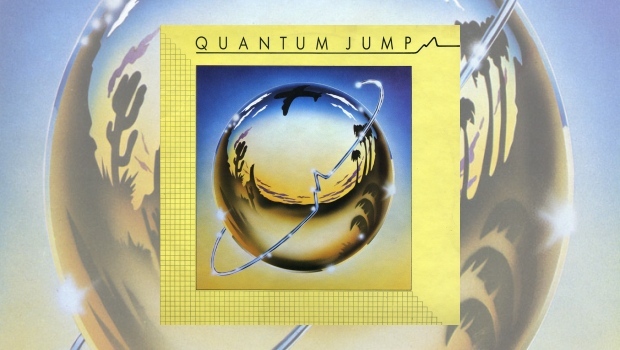 Quite what Quantum Jump were trying to achieve with this piece I’m not sure I’ll ever know, but it certainly took me by surprise, especially compared to the first half of the album. Esoteric have done a great job on this reissue, restoring the original yellow-framed artwork including the lyrics and adding a few bonus tracks for good measure, including a fusion-y single B-side Drift as well as the disco remixes of the first side of the album from 1979. You can see for yourself which version you prefer. The Lone Ranger suffers by becoming more tame and monotone, while No American Starship (Looking for the Next World) gets an interesting boost with the outro extended by a minute and with more spacey effects giving the feel of being pulled into a vortex. Marco Rossi also pens a comprehensive history and summary of the album, eloquently describing it as “a bubbling bouillabaisse of edgy funk, immaculately precise fusion and slyly pertinent lyrics”. Very well put.